I am starting to really look forward to warmer weather and all of the changes in the kitchen that occur with that. I do love my comfort food and nothing can ever replace a good, old-fashioned hot casserole or steamy bowl of soup in my opinion. But I do love the salads and fresh fruits and veggies that come with summer. 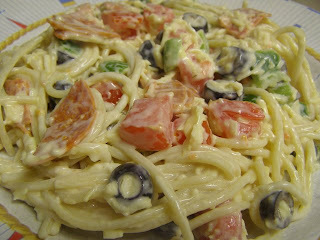 This is one of my all-time favorite pasta salad recipes. During the summer, I make this at least once a week. The original recipe, which I lost a long time ago, came from my aunt. So I’ve been enjoying this ever since I was a little girl and I haven’t gotten tired of it yet! 1. Combine tomatoes, green pepper, olives, pepperoni, salt & pepper, and dressing in a large bowl. 3. Add cheese and spaghetti to bowl. Toss to combine. This looks very yummy! I love pasta salads. I know what you mean about the veggies of summer. I love salad and veggies so I also look forward to it. periodontics, prosthodontics, dental pharmacology as well as radiography. requirements. Kids below 9 years old typically find it difficult to swallow tablets.